A couple of days ago, the National Gallery of Victoria announced next year’s Melbourne Winter Masterpieces Exhibition – “Italian Masterpieces from Spain’s Royal Court, Museo del Prado”. Excuse me while I struggle to contain my excitement. 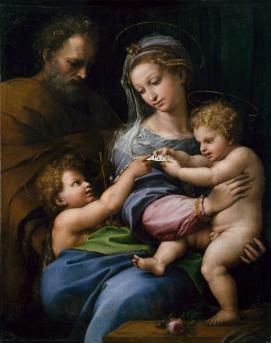 Key works to be shown in Melbourne next year include Raphael’s Holy Family with Saint John or Madonna of the rose (c.1516), Giambattista Tiepolo’s The Immaculate Conception (1767–69) and Titian’s Philip II (1551), a gloriously drab portrait of Spain’s king Phillip II wearing a bejewelled suit of armour and a ridiculous pair of pantaloons. In fact, looking at the featured works for this exhibition actually just reminds me of this amazing blog. On a less sombre note is Andrea di Lione’s Elephants in a Circus (1640) a frivolous Baroque piece featuring costumed elephants and frolicking men in an age when animal cruelty just wasn’t a concept. But I digress. Don’t get me wrong – as an art history major with a soft spot for Renaissance art (although not Baroque…definitely not Baroque) I can see the appeal of this exhibition and it is, as the NGV says, a major win for Melbourne that places it on an international playing field. These are some big names we’re talking here. What irks me is that this, and previous, Melbourne Winter Masterpieces all seem to follow two distinct trends: euro-centric and male dominated. Last year, we had Monet’s Garden; in the same year there was Napoleon: Revolution to Empire; 2011 brought us Vienna: Art & Design; 2010 offered European Masters: Städel Museum, 19th–20th Century; in 2009 there was Dali: Liquid Desire; 2006 presented Picasso: Love and War 1935-1945- hell even the non-euro-centric ones featured Tim Burton (2010) and Tutankhamun and the Pharaohs (2011). Where are all the ladies at? According to Arts Victoria Melbourne Winter Masterpieces is an annual series of major exhibitions designed to ‘offer Victorians the opportunity to experience exclusive art exhibitions of the highest international standards’ and also to draw tourists. Well, who better to draw a crowd than good old Raphael? For me, this exhibition is playing it too safe. Sure, I might head down to see it- even after all my ranting I must admit I can’t resist some good art hype, but ‘the highest international standards’ unfortunately seems to exclude anything other than white European men. I’m not accusing Arts Victoria of anything unsavoury — the NGV has a great level of diversity in its exhibition program this year — but in light of previous Melbourne Winter Masterpieces I was expecting something a little different, maybe even a little spunkier? This entry was posted in Art, Culture and tagged art, arts, australia, melbourne. Bookmark the permalink.